With Halloween on the horizon, consider some of the following safety tips to keep you and your children safe during this exciting time of year. One of the biggest concerns about Halloween Trick-or-treating is visibility, especially after dark. Consider adding reflective tape to costumes and bags. Encourage children to use glow sticks and flashlights with fresh batteries so they can easily be seen by drivers. Ensure your child’s costume fits properly to avoid tripping. Consider face paint versus masks to improve your child’s visibility while walking around the neighborhood. Masks can obstruct a child’s vision making face painting a safer alternative. Be alert! Keep electronic devices tucked away while walking down the street. Teach children to watch for cars that may be backing out of driveways or turning a corner. Only cross the street at corners or crosswalks after looking left, right, and then left again. Make eye contact with any drivers ensuring that they have come to a complete stop prior to crossing the street. Always look and listen before walking into the street. As you go, use sidewalks or pathways whenever possible. If there are no sidewalks, teach children to stay to the far left side of the road walking towards traffic. This way they can see cars and cars can see them. Stay on well-lit streets for added safety. There is safety in numbers, so consider going trick-or-treating with family members or friends. Plan to have at least one adult go along with groups of children. It is always safest to cross the street as a group. If children are old enough to go out without an adult, make sure they have communicated a planned route so parents know where to look if children are not home by a designated time. Use Halloween as an opportunity to teach children parent contact information, their home address, and how to get a hold of someone in case of an emergency. Remind children to only visit houses with porch lights on and to never enter the home of a stranger or accept a ride from someone they do not know even if that person is offering Halloween treats. 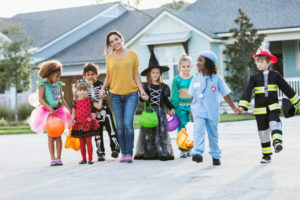 Often local malls or places of worship will offer free or low-cost Trick or Treating alternatives where children can still dress up and receive candy without the dangers of walking around in the dark from door to door. As a participant, consider offering non-food treats to children who come to your door. Items such as coloring books, pencils, playdough, or stickers may be a welcomed alternative to families who visit your home. Additionally, for the safety of those visiting, make sure the pathway to your door is free of debris and your porch light is on. For your jack-o-lanterns, consider LED battery operated candles rather than those with an actual flame. Check for Allergy and Safety Concerns. After returning home safely, an adult should check all candy and treats for anything that is open or loose in the bag. Unwrapped candy and treats may not be safe for children and should be discarded immediately. Hard candies and lollipops should only be given to older children who are able to chew without difficulty. To prevent children from binging on too many sweets, separate candy into pre-determined amounts. Rationing candy will not only prevent stomach aches from overeating, it will also encourage your child to wait which in turn teaches him patience and self-control. Many dentist’s offices in the Greater Austin area collect candy to send to troops overseas. Visit (Link to http://www.halloweencandybuyback.com) to find out more information along with the contact information for several participating dentists’ offices near you. Encourage a little scientific exploration during those days following Halloween. Visit this link to find several experiments based around candy (Link to https://littlebinsforlittlehands.com/halloween-candy-science-activities-stem/). Stepping Stone School wishes you and your family an enjoyable and safe Halloween!